Kandi and Geely Enter Into Joint Venture Contract to Establish Zhejiang Kandi Electric Vehicles Co, Ltd.
March 25, 2013 11:56 ET | Source: Kandi Technologies Group, Inc.
JINHUA, China, March 25, 2013 (GLOBE NEWSWIRE) -- Kandi Technologies Group, Inc. (the 'Company' or 'Kandi') (Nasdaq:KNDI), a leading Chinese manufacturer and developer of pure electric vehicles (EVs) and all-terrain vehicles (ATVs), today announced that on March 22, 2013, the Company's wholly owned subsidiary, Zhejiang Kandi Vehicles Co., Ltd ('Kandi Vehicles') entered into a Joint Venture Agreement with Shanghai Maple Guorun Automobile Co., Ltd. ('Shanghai Maple'), a 99% owned subsidiary of Geely Automobile Holdings Ltd. (Hong Kong Stock Exchange, Stock Code: 175) (the "Geely") to establish a joint venture company of Zhejiang Kandi Electric Vehicles Co., Ltd. (the "JV Company"). Pursuant to the JV Agreement, the registered capital for the JV Company is RMB1 billion (approximately $160 million) and each party will contribute 50% of the registered capital in cash and will each own 50% of the JV Company. The business scope of JV Company is to develop, manufacture and sell electric vehicles (the "EVs") and to develop, purchase, manufacture and sell auto parts, and invest in other companies which engage in such businesses. The JV Company will acquire EV assets from Kandi and Geely in order to possess the necessary properties, assets and technologies to conduct its EV business. The JV Company will leverage the strength, resources and expertise of both Kandi and Geely in the EV segment to develop and provide affordable electric vehicles and efficient services to its customers. The primary product of the JV Company will be to provide EVs and EV services for the intra-city public transportation and it will use the experience of EV operations in Hangzhou City to promote the use of EVs and make it the leader in the electric vehicle market. 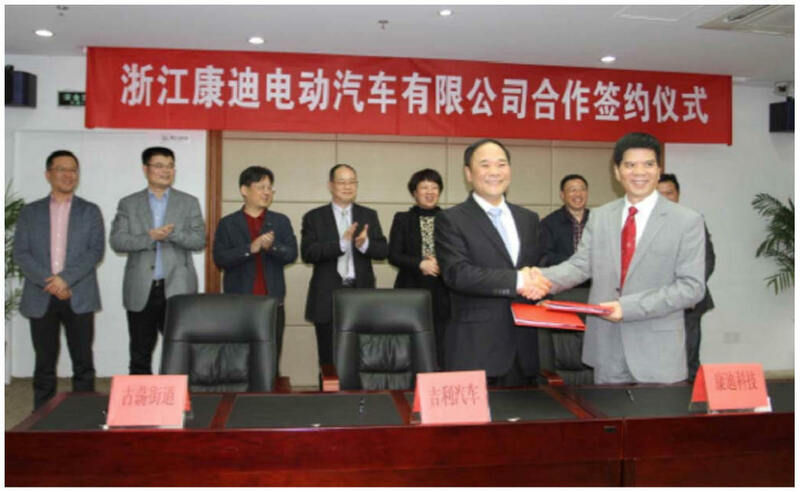 A signing ceremony was held at Xihu District in Hangzhou City of Zhejiang Province for the official execution of this joint venture agreement to establish the JV Company. The ceremony was hosted by Zhu TangQi, the director of Xihu District, where the JV Company will be located. Wang LiHua, the party secretary of Xihu District gave a speech at the event. Tong Guili, Vice Mayor of Hangzhou Municipal City also attended the signing ceremony and congratulated the successful signing of this joint venture agreement. Mr. Li Shufu, Chairman of Geely Automobile Holdings Ltd.and Mr. Hu Xiaoming, Chairman of Kandi both made keynote speeches at the ceremony. Mr. Li Shufu commented, "Over the years, Geely has accumulated extensive technologies from its resourceful research and development for EVs as well as rich experience in sales and marketing for EVs and has proven its business model in this area. We believe that the electric vehicle market segment will have a promising future and big space to grow in the auto industry." "With growing consumer environmental consciousness and urgent demand for urban green public transportation systems, the EV sector will certainly become an important driving force for the green economy in the near future in China. The JV Company has the fundamentals for achieving the green economic goals and will help build a strong and reliable green transportation system for the society," concluded the Chairman & CEO of Kandi, Mr. Hu Xiaoming. Kandi Technologies Group, Inc. (Nasdaq:KNDI) is a manufacturer and exporter of a variety of vehicles in China, making it a world leader in the production of popular off-road vehicles (ORVs). It also ranks among the leading manufacturers in China of all-terrain vehicles (ATVs), specialized utility vehicles (UTVs), and a recently introduced second-generation high mileage, two-seat three-wheeled motorcycle. Another major company focus has been on the manufacture and sale of the COCO electric vehicle (EV), a highly economical, beautifully designed, all-electric super mini-car for neighborhood driving and commuting. The convertible and hardtop models of the COCO EV are available in the United States and other countries, while the Chinese government has approved the sale of Kandi EVs in China since 2010. More information can be viewed at its corporate website is http://www.kandivehicle.com/.